I'm doing a spray job and I'm getting patchy lines in the finish, almost like there's a difference in sheen when you look down the wall in strips where I've sprayed. I've tuned the sprayer in until the point at which the tails dissappear, but I'm sprayed till getting it. Any advice asap would be appreciated, I'm bang in the middle of spraying. The paint is an acrylic scrubable paint, this is second coat, would another coat help? I'm looking at your photo on my phone but it looks spayed light and uneven ( inadequate overlapping). I'll take a look on the computer when I get home. I think you're right Brian. 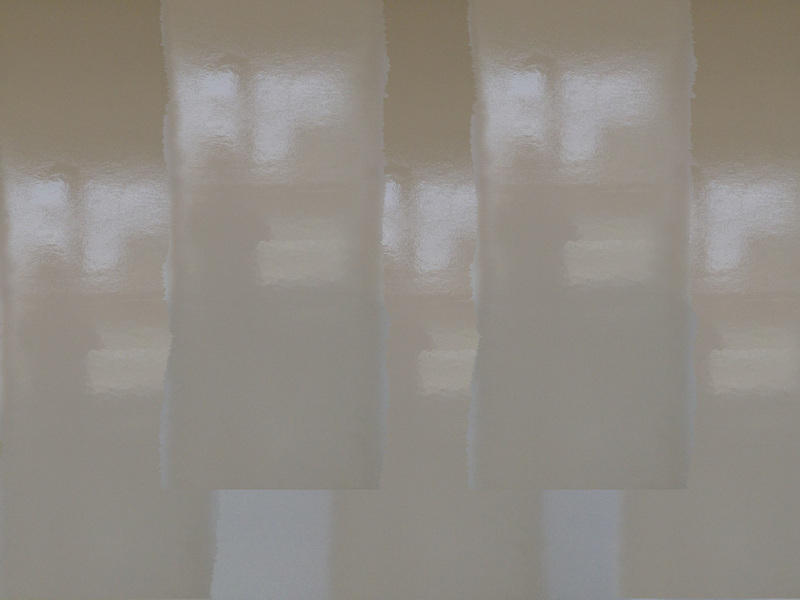 I'm not overlapping enough on each pass, this paint sags awfully, and I think I was mindful of that when spraying it. I changed paints to one I'm more familiar with spraying, I noticed straight away the difference in the applied coat, solid and thicker. Let's examine the issue by using these 3 photos to demonstrate what needs to occur when spraying walls. In this first photo we have essentially the same result you experienced, only its a dry version (sprayed very light) and under recommended mils. If you were to spray another pass over each light area in this photo, it would produce the same result you experienced (heavy, light, heavy light). The additional pass is not equal in mils to its surroundings which results in (shiny dull, shiny dull) streaks in the finish. So, when we spray large surfaces such as a wall, we need to pay special care to the overlapping. We want a nice solid coating by overlapping 50/50 or better with the spray gun held straight and even at the wall. While this photo is an overkill example of (wet film) as far as mils go, it is what the paint should look like when sprayed (very solid and wet) assuming no backrolling occurs. Okay, back to the first photo... what we see here in this photo below is the elimination of 1 overlap so we can see what the pass on the wall looks like on its own (without overlap). Even though tails are not visible, the rigid edge of the spray pattern has the potential of producing stripes. In other words, the edge of the spray pattern held at a certain distance from the wall does not produce the best feathered edge. If we step back a bit, we would eliminate the rigid edge of the spray pattern. Its plenty wet, just held too close to the wall. Notice how the right edge is feathered more than the left edge below. This is a result of not holding the gun straight and too close to the wall. Right side is good (feathered), left side produced a hard edge. The point here is that if you made one pass over the bare drywall (as you see it in this photo) its mils will not be equal to the pass on either side. When it dries, you see what you experienced (stripes). Same is true when rolling walls. 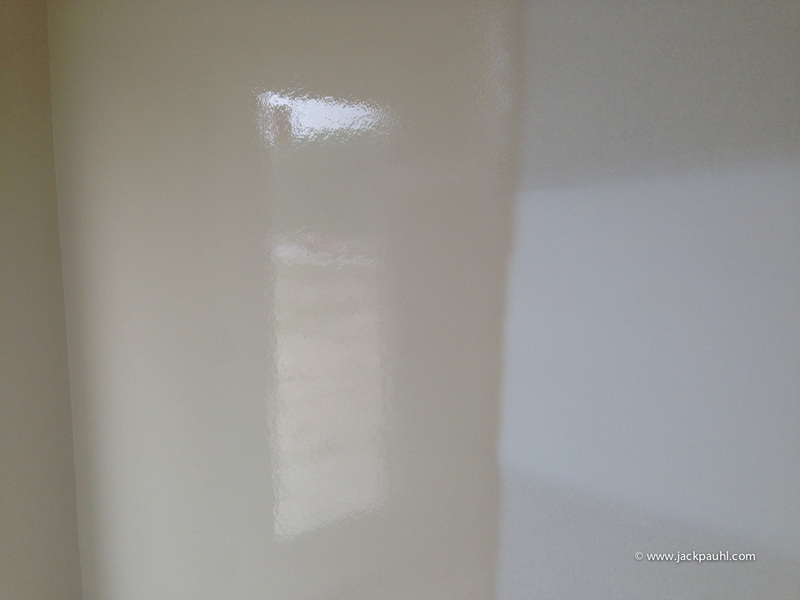 Having said that, spraying over bare drywall for the first coat is far more forgiving due to absorption, whereas if this occurred during the second coat... you would likely see striping occur. Better example... ask yourself... will this dry even? Now that's a good example. Well this just explained the nessesity for a 50/50 overlap perfectly. Being new to this area I've really not been focusing on that part of the spraying, I've just been taking for granted that I was getting enough overlap, when clearly I haven't been. The film looks even when it goes on, but then when drying you can see the differences as certain areas dry quicker. I took this on board today and the results were noticeably difference, I had a nice even coat that dried at the same rate. 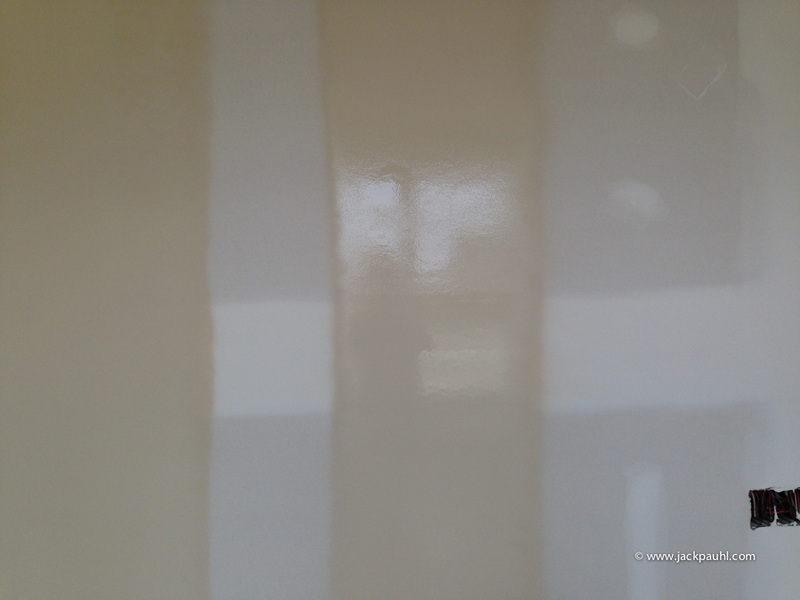 The drying process is critical when learning, I noticed today with a nice solid coats on the centre of the walls that I've been to lite in applying on my internal and external corners and around openings, as they were drying noticeably quicker. Did I read correctly on here, that on new walls it's best to apply a heavy coat for base followed by a lighter topcoat. Hey, I think that applies to the prime coat because of the absorption into the paper, however, if you were to Prime with Gardz, then I don't think that would be the case, cause there would be no absorption. The Paint would sit on top of the Gardz because of it's sealing properties. So how do I go about dealing with my zebra effect walls? It's still there if I add more coats. Because I want a sprayed finish, i can't roller gardz on. Would going over with a self priming paint get rid of it. And then go over with the paint I've used on the rest of the walls. The previous result needs to be resolved before spraying additional costs. 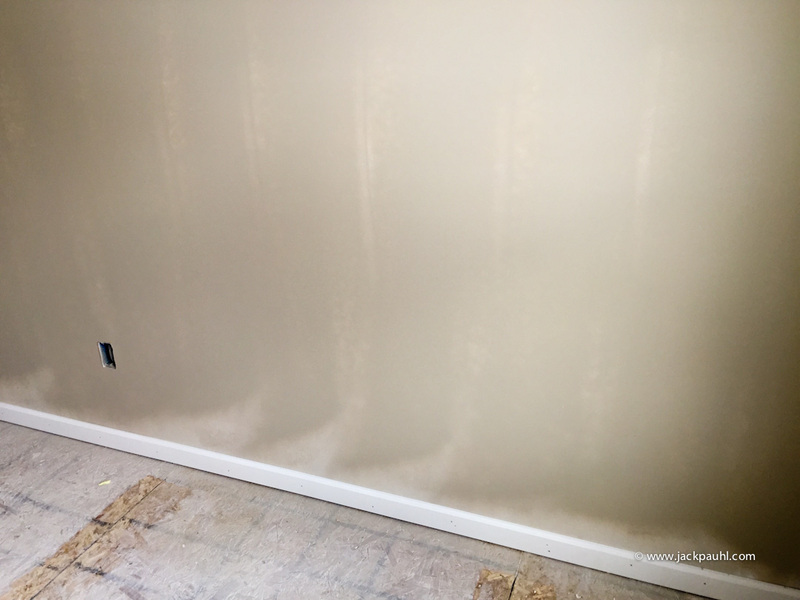 Typically once it occurs, it's very difficult to resolve without aggressive sanding or floating the wall with mud. In other words it's pretty much part of the wall now until you fix it. I sprayed the problem coat very light. It's almost like it's a build up of sheen in places rather than too much thickness. It shouldn't be too much of an issue to sand, but there is a fair bit of it. I have to be out of there tomorrow so I was looking for an easy fix. The difference in sheen tells us there is a difference in thickness.